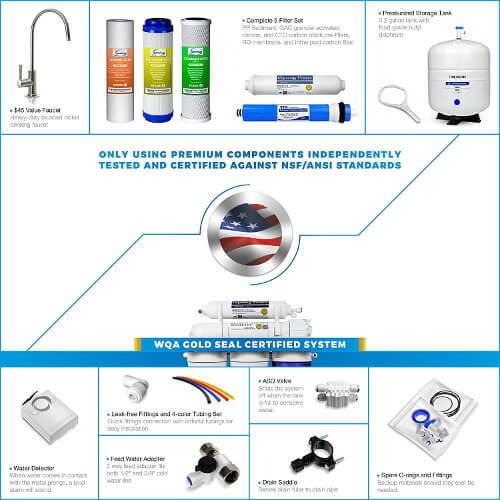 Shopping for an affordable under-counter reverse osmosis system? 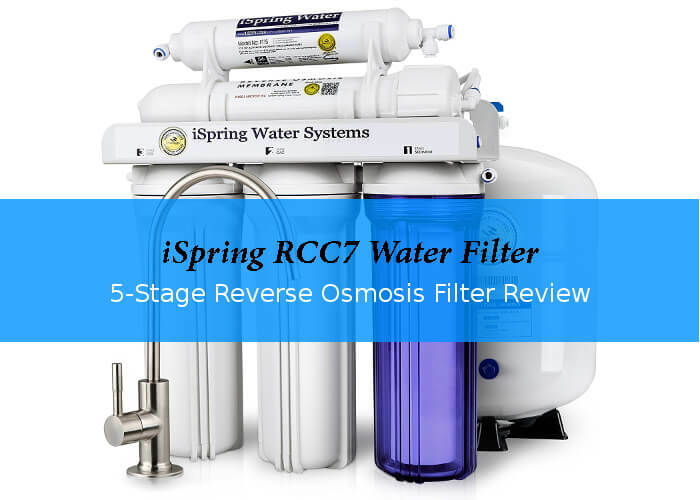 Read my review of the iSpring RCC7 5-stage reverse osmosis water filter. On Amazon, this is a bestseller. But right so? And how does it compare to other models? The iSpring RCC7 reverse osmosis under- sink system produces enough purified drinking water for a family. Here is a quick overview. Warranty 1-year money back guarantee, 1-year limited warranty, and lifetime technical support. iSpring RCC7AK - What is the difference? What I especially like is the clear housing for the first carbon filter. The first filter is always the first one to clog if your water has a lot of sediment or other particles. You can take a quick look and see if it might need replacement. No need to search for the wrench to open the housing. The old version of this model had a few flaws. But 2014 iSpring listened to customer suggestions and improved the former model. That was a great way to make a good RO system even better and gives me confidence, that if there are future problems, the company will listen and take care. Apart from a nicer faucet, the improvements were not just cosmetic. The new system now has a feed water adapter for easier installation. The storage tank valve is more durable and of better quality. Same goes for the shut-off valve. The RO membrane, heart of the system, now also features a higher rejection rate. And last but not least, the quality of post-filter medium improved. I am not surprised, that customers value iSpring's effort. For example, more than 3.300 customers reviewed the iSpring RCC7 water filter on Amazon and while I write this, it has a 5-star rating. 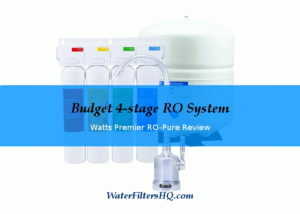 Water filter manufacturers claim great removal rates and system performance. If you want to be sure, that their claims hold up to independent testing, you should look for a certificate. This system is independently certified by the Water Quality Association (WQA) and allowed to carry their Gold Seal. This seal indicates, that the system was tested to NSF/ANSI STANDARD 58. for reverse osmosis systems. Reverse osmosis water purification takes care of a lot of different water problem. The iSpring RCC7 with it's carbon pre-filter gives contaminants like prescription drugs a charge. As a result, most of them are eliminated from the water. The contaminant removal rates are quite impressive. Here are a few test results. 1st filter housing is transparent. It is easy to see if a filter change is due. Color coded tubing and quick-connection fitting for easy installation. You need a tool (included) to open the filter housings. 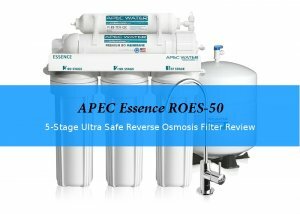 This high performance reverse osmosis filter has five stages. The components are certified against NSF/ANSI standards, not all manufacturers make the effort. Check this, three 5 micron pre-filter in a row. Many other systems use less effective 10 micron filters here. A 5 micron 10" polypropylene sediment filter prevents dust, particles, and rust from entering the system. A 5 micron granular activated carbon (GAC) filter takes care of chlorine, bad smell and taste, cloudiness and coloration. The second 5 micron 10"carbon block filter gets rid of the chlorine, bad taste and odor as well as other impurities that made it through the previous stages. This high rejection .0001 micron TFC RO membrane is able to remove a wide range of contaminants. See the rejection rates. The polishing filter adds to the clean taste. The pressurized tank of this system can hold up to 3.2 gallons. If you have to squeeze the system under your counter, it is good to know, that you can mount this filter horizontally or vertically. A brushed nickel faucet is included when you purchase the iSpring RCC7 RO water filter unit. This European-style faucet is lead-free and will look great in your kitchen. The whole RO unit also comes with filter housings and membrane wrenches, a tank ball and a feed water valve, drain saddle, inserts, spare fittings and O-rings, and installation manuals. An ice maker kit is available, but not part of the package. The amount of water that goes to waste is usually one of the main reasons not to buy a reverse osmosis water filter. The iSpring RCC7 come with a fairly good waste water ratio of just 2:1. Even in arid areas with occasional water shortage, this would be acceptable. 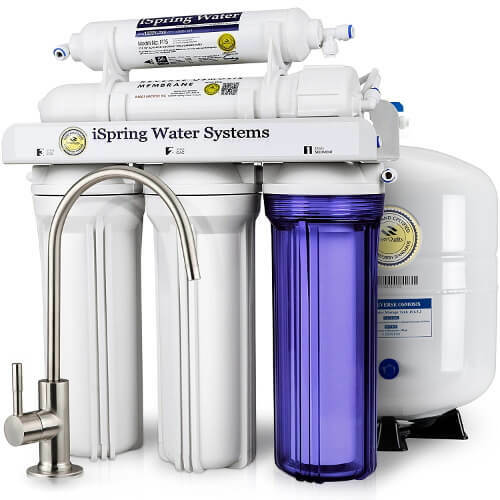 The iSpring Water Systems LLC is a Georgia, USA based family business. They concentrate on the production of reverse osmosis units for commercial as well as residential customers. Quite unique is the one year money-back warranty and lifetime technical support you receive when you register your product with them. Ebay and Amazon customers rate them and their product quite highly. To install the iSpring RCC7 RO unit at your house, you just need a few tools, most people have at home like a variable speed drill with a ¼” drill bit to make a hole on the PVC drain pipe, an adjustable wrench, pliers, a Phillips screwdriver and a utility knife or scissors. The only not so common tool might be the ½” drill bit (Diamond Core Bit for granite, and a titanium drill bit or steel) you would need if you do not already have an extra hole in your counter-top for the drinking water faucet. The tubing is color coded and the easy-click connections speed up the installation. Once it is time to change the filters, you need to get the filter wrench out that came with the system. Apec is using filter housings you can open without a tool. A better solution in my opinion. For best results, water temperature and pressure must match the requirements. If you water pressure is lower, iSpring offers the same system with a booster pump. iSpring recommends to change the first three filters every six months and the post-filter every twelve months. The iSpring RO membrane has a lifespan of two to three year. That are typical filter change intervals for this kind of residential under-sink RO systems. A one years supply of filters costs around $70 (List price). Often there are cheaper offers for this replacement filter pack available online. When I wrote this, Amazon had an offer for nearly half that price. Some people simply do not like the kind of flat taste of reverse osmosis water. If you are one of them, iSpring offers the same system with an additional alkaline filter to add minerals back to the cleaned water. This mineral filter not only make this model a bit more expensive, it also raises the price-per-gallon a bit as you have one more filter to replace regularly. Another variation of the same system is the iSpring RCC7P, the basic system plus a booster pump to increase the water pressure. Before you decide for this model, please keep in mind, that the pump needs electricity to operate. And if you not already have an outlet under your sink, this would mean extra installation costs. iSpring also offers a combination of the basic 5-stage RO system with booster pump and a mineral filter. It costs roughly $100 more than the basic system. The iSprinkRCC7AK-UV is a 7-stage reverse osmosis system, based on the basic model. Additionally you get a mineral filter plus an UV-light to kill any germs that grew inside the system. How likely that is? Honestly, I have no idea. This model is also the priciest variation, not only when you purchase it, but also with the highest running cost. iSpring had end-customers like you in mind when they designed the iSpring RCC7. You get up to 75 gallons of clean drinking water per day. Plus, with the WQA seal you can be confident, that the removal and quality claims are real. The clear pre-filter housing, low waste water rate and life-time technical support are nice features. If you are looking for an under-sink reverse osmosis unit, you should seriously consider this one. Especially, if you can get it at a discount. With iSpring's 1-year money back guarantee you are covered.